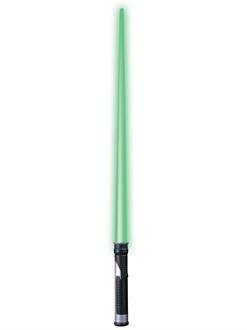 Jedi Master lightsaber, with extending green plastic sword, uses 2 AA batteries (not included). The packaging for this product may differ from what is shown in image, the correct style of lightsaber is included in the different packaging. This package change was made by the manufacturer. We apologize for any inconvenience this may cause. This is an officially licensed STAR WARS™ product.